Boston Bruins forward Matt Beleskey puts a knee-on-knee hit on Detriot Red Wings forward Gustav Nyquist. This is a dangerous hit and needs to be eliminated from the game of hockey. There was no penalty assessed on the play and Nyquist appeared shaken up on the play. Detroit Red Wings forward Henrik Zetterberg scored his 11th goal of the season, but it appears that he might have been a bit lucky. Although the video was not able to confirm, Red Wings forward Justin Abdelkader "might" have been offsides at the blue line. The Bruins challenged the play, and as usual, they lost. So, was the play offsides or not? #NHLBruins using their Coach's Challenge. The call on the ice stands. Good goal. 1-1 game. Detroit Red Wings forward Tomas Jurko was given a two-minute minor penalty for this cross-check on St. Louis forward Scottie Upshall. This is a hit that happens 100's of times a month. It's a dangerous hit that needs to be eliminated from all level of hockey. Although not usually a malicious hit, there have been quite a few players hurt on this type of hit. Another former college head coach has been named head coach in the NHL. Noah Trister, the Globe and Mail -- Jeff Blashill was hired Tuesday by the Detroit Red Wings, ending a fairly un-suspenseful coaching search that began when Mike Babcock left to take over the Toronto Maple Leafs. Blashill has coached Detroit’s minor league affiliate in Grand Rapids for the past three seasons, and he was an obvious candidate for the Red Wings once Babcock left. Detroit general manager Ken Holland acknowledged right away that he was going to talk to Blashill about the job, but the Griffins made it to the conference finals in the AHL playoffs. Blashill’s promotion was announced Tuesday. Blashill led Grand Rapids to the Calder Cup in 2013. He says he’d been eyeing the Red Wings’ job since it became clear Babcock’s future was uncertain. A Detroit native, Blashill coached at Western Michigan before joining the Red Wings’ organization. Blashill was an assistant coach for the Red Wings in 2011-12 before taking over at Grand Rapids. It looks like Detroit Red Wings defenseman Niklas Kronwall might have finally earned himself a suspension after this hit on Lightning forward Nikita Kucherov. I think that Kronwall might not be able to get out of this one. NHL Department of Players Safety -- Detroit Red Wings defenseman Niklas Kronwall will have a telephone hearing Tuesday with the NHL Department of Player Safety for a hit against Tampa Bay Lightning forward Nikita Kucherov during Game 6 of the Eastern Conference First Round at Joe Louis Arena on Tuesday. Kucherov was hit by Kronwall at 19:00 of the second period. No penalty was assessed on the play and Kucherov remained in the game. The following grounds are being considered for supplemental discipline: charging/illegal check to the head. However, the Department of Player Safety retains the right to make adjustments to the infraction upon review. The hit of the night. Detroit Red Wings defenseman Niklas Kronwall steamrolls Tampa Bay forward Nikita Kucherov. Get off the track if you don't want to get run over. I guess you could make the argument that Kronwall hits Kucherov in the chops with his elbow. That being said, I see nothing wrong with this hit. With the win against the Chicago Blackhawks last night, the Wild are in the Stanley Cup Playoffs. There's one spot remaining in the West. 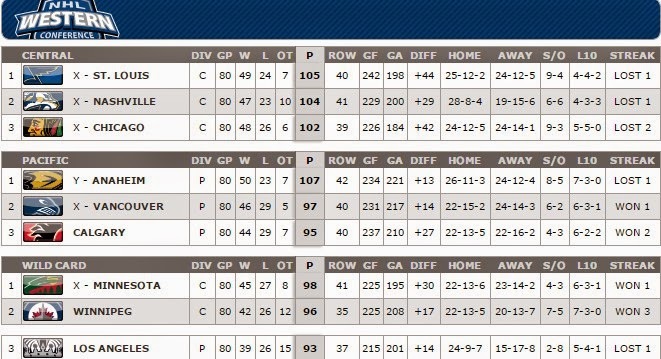 In the East, the Bruins, Pens and Senators are fighting for the remaining spot. It's going down to the wire. From the blown call department. Here's the video of Detroit Red Wings forward Drew Miller's disallowed Goal. If you look closely you will see that Washington Capitals goalie Braden Holtby trips all by himself. Red Wings forward Luke Glendening was given a two-minute penalty for goalie interference. 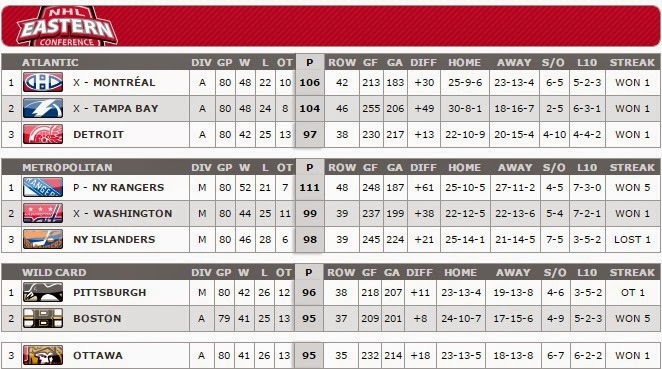 If you're a Detroit Red Wings fan, you've got to be pretty happy today. They're getting a shiny new arena. They will begin constructing it this September, with the ground breaking. 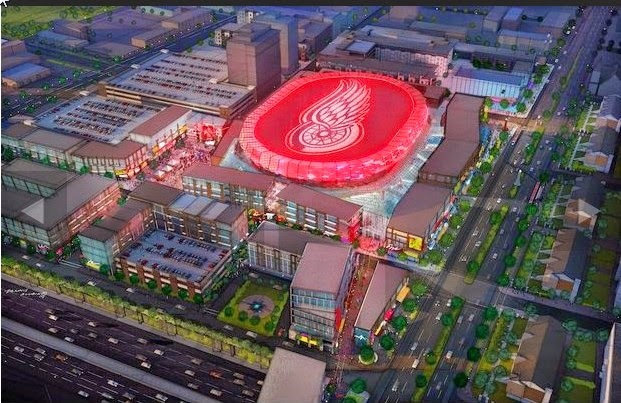 $650 million Detroit Red Wings arena and district plan is out and I found out @yingyangtwins are coming to Hamtramck in September! #bonus! Pretty light free agent action during the holiday weekend. In my opinion, this has been an uneventful free agency signing so far. Looking at the list, there's not a lot of attractive options out there. As a fan of the University of North Dakota, none of us are shocked by these revelations. We have seen it numerous times. We will see it again, probably sooner rather than later.